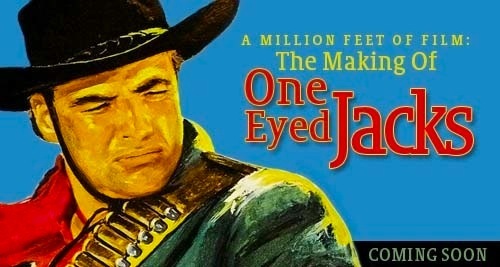 One-Eyed Jacks | 50 Westerns From The 50s. What happens when “the world’s greatest actor” directs a cowboy movie? More than three years from contracts to premiere. Six months of shooting. A thousand takes. Almost 200 miles of negative exposed. A revolving door of personnel, including Rod Serling, Sam Peckinpah and Stanley Kubrick — who’d all be gone before the first frame was shot. And a budget that ballooned from $1.8 million to $6 million. 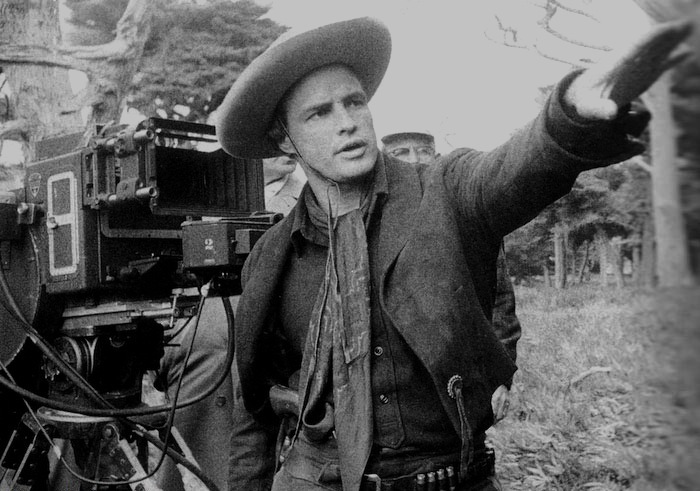 A Million Feet Of Film is the story of One-Eyed Jacks (1961), Marlon Brando’s first, and only, time as a director and a picture that may be better known for its troubled production than its merits as a film. It’s also the story of the picture’s influence on the Westerns and filmmakers that came after it. Watch this page for updates or email fiftieswesterns@gmail.com to find out more. Also, check out A Million Feet Of Film on Facebook. The banner was designed by Angela Miller. This is my favorite cowboy movie of all time. Does anyone know if a “director’s cut” of this movie has ever been released. Like Karl Malden’s comment I would love to see the movie Brando was trying to make! The story goes that Brando’s rough cuts and all the unused footage were recycled for their silver content. With over 200 miles of film exposed, that’s a lot of silver. It was common at that time for rushes/dailies to be printed on b&w stock for editing as it was cheaper than colour print stock so that may well have gone for silver recovery. It would have been unusual to recycle the negative colour film for its silver content as relative to b&w stocks it yields little value. Storage would have been an issue so it’s quite likely it was just dumped. As the original sound recordings and transfers would have been. If a longer cut was ever finished there may have been intermediary elements prepared which could have survived as with “Touch of Evil”. Given that the title appears to be public domain I would have thought these would have surfaced as a way of reclaiming the title via a “Directors Cut” if they existed. One Eyed Jacks … 1961 … great Western. May very well make it onto MyFavoriteWesterns. The Appolossa (1966) is also a worthy Western with Brando and John Saxon. I’m interested in improving my education about Westerns from the 30’s, 40’s and 50’s. I know very little about them. And with each year these films seem to fall farther into obscurity. That is a terrible shame. Thanks to a fistful of dedicated fans – like this site – this lore, information and artform can be kept alive. Thanks. Sounds like a book I would love to read! If I could only get it finished! Unfortunalely it was not often the habit to save cut footage from older movies – like they do today. Who could envision Director’s Cuts or Extended Versions, etc? It’s a shame because I believe there would have been much added enjoyment for us. As wonderful as it would be to see the film as Brando saw it, it’s been a lot of fun researching how it was deconstructed by Paramount. WOW ! that is a great cast. gotta give that another watch. deconstructed … that was done quite a bit sadly. the money brokers have one thing in mind … and it aint art. Wwhen this came out, I was a total Brando fan and I loved the movie. I was surprised that other people didn’t like it as much as I did … but maybe they weren’t in love with Marlon. I still like it. No matter what anyone says! First saw it on TV (the afternoon movie two days in a row) and was fascinated by it. Writing the book on it has actually made me appreciate it more. Should’ve passed this along a while back. Here’s the Facebook page for my book. I’ve put some cool stuff from my research on there. I like One-Eyed Jacks too. I saw it not long ago and the film quality is so poor (unfortunately). I was impressed by it because, to me, it is an atypical western. I hope someone will petition to the distributor to restore and reprint the original films. Such a good film, it deserves to be seen as it should be seen. Also, since Brando is an influential actor, I really feel all his work should be maintained and preserved for not only the film history but the future generation. Pickens has a great part as well as Karl Malden. I really haven’t covered this movie yet on my Blog yet (so much to do – so little time!). It Is surely a Western Classic – so your book would be a great resource. Brando was a true renegade.- but nobody could deny his charisma or talent. Looking forward to your book. Can’t really understand why this film had (and sometimes still has) such a bad reputation. Ever since I saw it for the first time (at the cinema from an excellent print, no less) it has not only remained one of my Top 5 favorite westerns, but easily one of the best films I’ve ever seen. Also, in my opinion Marlon’s acting has never been better. Too bad Brando didn’t continue to persue a directing career. My head starts spinning if I wonder what could have been if he had tried to occasionally direct a film throughout the 70s, 80s and 90s. Toby, I’ve heard that One-Eyed Jacks will be released later this year by Criterion. Have you heard anything to confirm it? I think this is a true western classic film. As someone had mentioned, it is an atypical film. How many westerns have you seen filmed on a beach? I recognized the jailbreak scene from the stories of Billy The Kid. The film also has a great cast of western actors, like Slim Pickens and Ben Johnson. This film came along at a time when Brando was riding the crest of his fame. He was at the top of the heap, having just come off of his great 1950s successes like Wild One, Streetcar, and Waterfront. The studio was ready to accept anything from him, but his first time directing job almost cost him his career and considerably cut his Hollywood clout down so low, it never fully recovered until the early 1970s with The Godfather. I don’t think it was the quality of the film that upset the studio. It was the money. Shooting miles of useless film, running over-budget, getting behind schedule. all the things that cost the studio money. That is what hits them the hardest and why they took the movie from him and did their own cut. I have heard he would have the entire crew wait all day to film a scene at the ocean right at a certain time to catch the setting sun at just the right position. The same for waiting for the ocean waves to form a certain pattern when the tide changes and makes it look rough to match the stormy scene going on in the foreground. These are artistic choices that worked well on screen, but was expensive wastes of money in the studio’s eyes. They were not concerned with artistic vision, they were only interested in the bottom line. It is a shame that he never got the opportunity to direct again. It would be interesting to see what kind of a director he would become and what kind of movies he would make. I think this could have been a good start to a great directing career, but it was not to be. I have a DVD copy that I got from the local dollar store. Since the movie is in the public domain anyone can make and market the movie, thus we have a flood of cheaply made discs of various degrees of recorded quality. I would like to see a high quality version released that would restore its original high quality color and cinematography. Considering Brando’s character, it’s really hard to believe that he didn’t direct again. ??? He liked to do his own thing. Brando was certainly good with the actors and everyone seems to have really enjoyed that part of the film. But the editing process and going back and forth with the studio soured Brando on the whole process. A little aside to the comments about One Eyed Jacks.I was a teenager when the movie was released. Some of you may remember a popular singer at the time was Johnny Burnette. He recorded a catchy song called ” The Ballad Of The One Eyed Jacks”. I don’t think it was a single but is available today on some of his cds. It’s a cool record and it WAS a single. Burgess died tragically not long after that. Glad to hear this. If they can figure out the editing. Wonder what Brando would think? Do they have a Brando edited version? Guess so. I’ve bought at least 4 different DVD versions of One Eyed Jacks and after quite a bit of research came up with a pristine print. This movie is in the public domain so you can watch it free online on our site. The Film Foundation under Martin Scorsese and Universal have done a 4K restoration of ONE-EYED JACKS. The new blu-ray is scheduled for release in the fall, perhaps as early as September. The film looked beautiful, it is a really fantastic restoration. If you have the opportunity to see it on the big screen, take it. It was the first time I had seen the movie. Your website brought it to my attention a couple of years ago and I resolved to watch it. I recently bought a really awful dvd transfer but it looked so terrible, I didn’t watch it. I’m glad now that I didn’t. It was a very good western, a little bit too long in my humble opinion, but very interesting and entertaining. It had that great quality of showing the main character’s faults somewhat unapologetically, a quality that seems to be prevalent in westerns, and particularly westerns of the fifties? Some of my favourite James Stewart westerns spring to mind. I thought the cast were all fine, Brando was good, as was Malden, Ben Johnson etc. I was particularly impressed with Larry Duran, it is great to see such talented actors in small parts. Imdb describes him as a bit-player and a stuntman, which surprised me a little based on what I thought of his performance in this. I thought Brando’s direction was good and clear, although the story could perhaps have been told a little more economically. The cinematography looked good, I have never seen a “coastal western” before. Anyway, thanks for bringing this movie to my attention through your excellent website. Keep up the good work and best of luck with the book, it should be an interesting one. Thanks for writing in. I’m sure jealous that you got to see the restoration in the theatre. I’m sure it was stunning. You summed up the movie’s pros and cons very well. Larry Duran has always impressed me, too. He began as Brando’s stand-in. He has a long career as a stuntman, but I think he could’ve cut it as an actor, too. He’s quite good and certainly likable — he’s the “nicest” guy in One-Eyed Jacks. Again, thanks for stopping by — and for letting me know I planted the seed that got you in front of One-Eyed Jacks. That makes me very happy. I was raised on movie schedules like that one. If I still lived there I would still be going to the Forum. No doubt about it. Their schedule looks like my home video collection. My compliments to Toby Roan for his valuable contribution to the supplements on Criterion’s blu-ray. It is much appreciated. Like to see the Restored film. Possibly even buy it. I suppose it may appear on Amazon at some point. Look fast for Larry Duran during the last scenes of the Brando version of “MUTINY ON THE BOUNTY”. Much admiration for all of the wonderful folks who worked on this BEAUTIFUL restoration making ONE EYED JACKS looking so good (finally). And for me, looking as close to the 35mm prints of the last century as memory serves! Praise for the Film Foundation for this–and for all of the other films now being saved and preserved now, for future generations to come. We live in a wondrous age where many of these films can now be improved and preserved. Bravo!